The recent Despicable Me 2 movie was a big hit among my kids. They were especially smitten with the adorable and mischievous Minions, those yellow-colored helium-voiced assistants that stole the show and became even more popular than Gru. Well, the Minions made the movie fun and enjoyable for the kids. My kids loved them so much that they just can’t get enough of them. They even asked me to get them some Minion toys to play with. It is a good thing that I found this 8-inch Talking Dave Minion Doll for them to have fun with. The 8-inch Talking Dave Minion Doll from Toys R’ Us will be an instant hit for your Minion-loving kids. It is not just an ordinary Dave Minion doll, it talks. Yes, kids will love hearing those helium voices once again through this 8-inch Talking Dave Minion Doll. It comes with 55 Minion sayings and effects using the original Minion voice. Kids only need to press Dave’s pocket to hear him talk complete with funny expressions. Move his head while pressing Dave’s pocket and you get a different response. You can do other things with Dave to get the other expressions out of him. 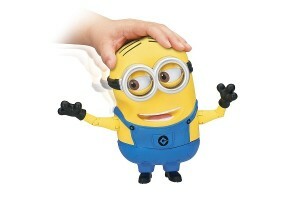 The 8-inch Talking Dave Minion Doll comes with soft skin and movable parts such as the arms and head to make or create different Dave expressions. This doll is designed for kids 4 to 12 years old. It is available at Toys R’ Us for US$40.